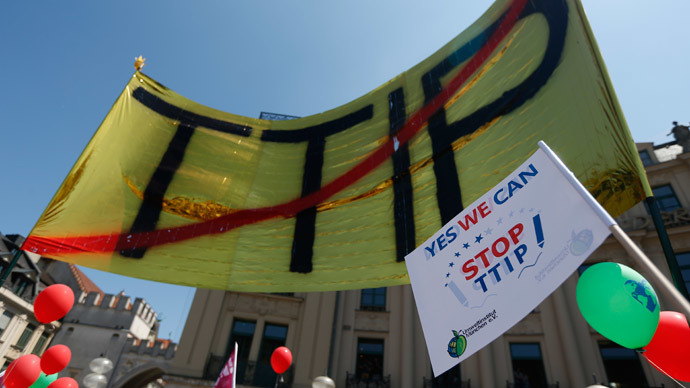 A key vote on the controversial TTIP resolution was postponed by European Parliament last minute on Tuesday. While a large number of amendments have been cited as the reason for the delay, some believe the "mounting public pressure" is "bearing fruit." The plenary Wednesday vote on Transatlantic Trade and Investment Partnership (TTIP) resolution was postponed by the European Parliament's president on Tuesday evening. The vote on the controversial report following the ongoing EU-US TTIP trade and investment negotiations will not take place "in view of the fact that more than 200 amendments and requests for split or separate votes have been tabled," President of the European Parliament Martin Schulz announced. A Wednesday vote was expected greenlight the EU's negotiating position on a free trade deal with the United States, Politico reported. Although Parliament’s resolution backing the European Commission in the talks is not essential at this stage, it's considered important for the project's success. Parliamentary leaders are still said to be holding the TTIP debate on Wednesday, but a new date for the vote has not been set. Reacting to the decision, some believe the "European Parliament's establishment is in panic" over TTIP resolution. The vote "will reveal the clear divisions within the larger political groups on the controversial EU-US negotiations," Greens/EFA trade spokesperson Yannick Jadot said in a statement, adding that an administrative procedure was used to "prevent these divisions from being put on the record." Strong rumour EU Parliament vote on #TTIP, scheduled tomorrow, has been postponed by president due to amendment volume. #EPvotesTTIP/or not. Calling this alleged division a "major turnaround" from a previous vote on the issue two years ago, Jadot said the delay "shows that the significant and mounting public pressure is bearing fruit." He added that his party will continue to raise concerns over TTIP. #TTIP vote postponed as panic prevails in EP establishment - http://t.co/B6zNioeS90 "shows mounting public pressure is bearing fruit." On Monday, a European Citizens' Initiative "Stop TTIP" reached a new record number of signatures, with two million people having signed the document, UK think tank Global Justice Now said, adding that the initiative is "the largest" since the introduction of the instrument in 2012. The large number of amendments "reflects just how controversial and contested this toxic trade deal has become," director of Global Justice Now Nick Dearden said on Tuesday. "MEPs know that the people of Europe do not want the introduction of secret corporate courts," he said. In May, senior UN official and human rights campaigner Alfred de Zayas called for the TTIP talks between Europe and the US to be halted, as there have been fears that the system of courts used by corporations in the negotiations would bypass human rights. UK's general trade union GMB has also warned against the deal, saying that Britain could be flooded with harmful currently banned chemicals if the TTIP resolution at the parliament is signed. TTIP is part of the so-called "T-treaty trinity," which also includes the Trans-Pacific Partnership (TPP) and Trade in Services Agreement (TiSA). Last week, WikiLeaks published a number of secret documents related to the latter agreement, which has been also negotiated behind closed doors between the US, EU and over 20 WTO members.